This being Worcester Restaurant Week, a few friends decided to go out and enjoy the great food that Worcester has to offer. 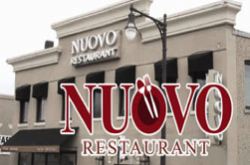 One of my favorite places is Nuovo, located on Worcester’s Shrewsbury Street. Nuovo is one of the most underrated restaurants in the city. It is consistently excellent, and the food is innovative. The night we dined, the place was full, but the service was flawless. Two of us opted for the Restaurant Week menu, while my other two friends ordered off the regular menu. Alex and his wife, Loretta, go out of their way to showcase Alex’s culinary skills. The Restaurant Week choices displayed this in spades. In order to sum up the variety of selections, I think I must first discuss an appetizer from the menu that one of my friends ordered. It was gnocchi in a tomato sauce laced with truffle oil. Marvelous is only one superlative I could use. The perfectly cooked pillows of potato were coated with sauce. We had all we could do to not lick the plate. But I digress. I ordered the vegetable arancini, rice balls stuffed with a puree of carrots, broccoli and cheese. The light crust created by the deep-frying hid a bejeweled interior. The flavors were sublime. My friend, who also opted for the Restaurant Week menu, selected the same. We diverged on the second course. I ordered the Caesar salad, while he chose a cup of the minestrone. The soup was clearly made on premises, with large pieces of vegetable, beans and chicken. The Caesar salad featured perfectly coated romaine leaves with fresh croutons. We also diverged on our entrée. I selected the seafood risotto, while my friend went with the pork Milanese. 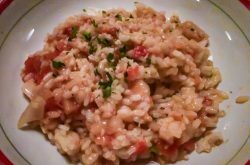 Small pieces of seafood, which included scallops and shrimp, were cooked with vegetables and served with al dente Arborio rice. The generous portion was rich and filling. My friend was served a large pork cutlet that had been sautéed with tomato and vegetables and placed on a large portion of mashed potato. The boneless cutlet was moist and flavorful. 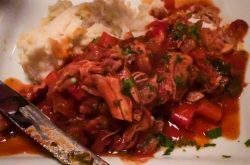 Once again, the portion was large and the richness of the flavors made it filling. All in all, it was a very pleasurable dining experience, as it always is. Alex and Loretta put their heart and soul into turning out great food at reasonable prices. They don’t skimp during Restaurant Week. It was another great meal at one of Worcester’s friendliest and tastiest restaurants. For Nuovo’s full Restaurant Week menu and to find more participating restaurants, click here.